This week I'm obsessed with... The Body Shop Expert Face Masks! 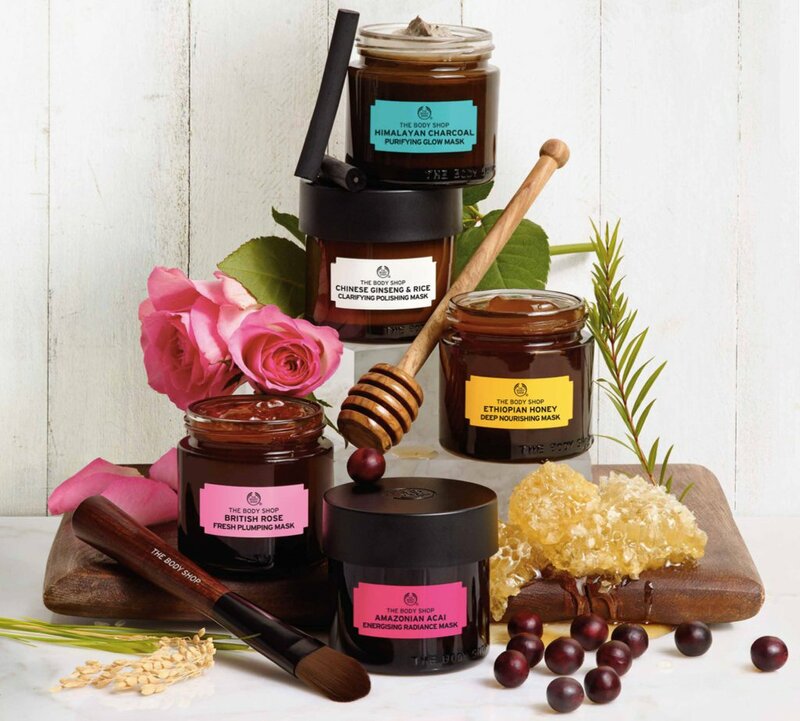 The Body Shop introduces a line of 100% vegetarian (some are also 100% vegan) Expert Face Masks chock full of natural ingredients and superfoods and formulated without parabens, paraffins, silicone or mineral oils - they are inspired by traditional beauty remedies from around the world to help skin look and feel amazing! Inspired by Ayurvedic traditions - Himalayan Charcoal Purifying Glow Mask - 75ml - $28 - for skin that needs to release impurities and toxins to help reveal a healthy looking, youthful glow. Contains bamboo charcoal from the Himalayan foothills - to draw out impurities and excess oils from the skin; green tea leaves from Japan - rich in antioxidants and catechins to effectively exfoliate the skin; and Community Trade organic tea tree oil from Kenya - to help keep skin looking clearer. Inspired by European bathing rituals - British Rose Fresh Plumping Mask - 75ml - $28 - for skin that needs to be quenched and re-plumped with moisture to reveal its dewy glow again. Contains real rose petals and essence of hand-picked roses from Britain - to freshly replenish the skin's water reserves; rosehip oil from Chile - rich in repairing omega 3 and 6 to help tone skin; and Community Trade organic aloe vera from Mexico - for it's gentle, calming and soothing properties on skin. Inspired by African healing and soothing rituals - Ethiopian Honey Deep Nourishing Mask - 75ml - $28 - for skin that needs an intense does of replenishing nourishment to feel soft and smooth again. Contains Community Trade honey from Ethiopia - rich in nutrients that replenish and retain moisture to comfort and revive depleted skin; Community Trade marula oil from Namibia - a cold-pressed light oil known to restore and improve skin's elasticity; and Community Trade organic olive oil from Italy - rich in omega 9 that helps boost skin elasticity and prevents dryness. Inspired by Chinese traditions - Chinese Ginseng & Rice Clarifying Polishing Mask - 75ml - $28 - for skin that needs an intense treatment to remove dullness and unevenness. Contains ginseng extract from China - to tone, stimulate and revitalize skin; rice extract from China - to moisturize and brighten; and Community Trade organic sesame seed oil from Nicaragua - rich in oleic and linoleic acid to soften the skin. Inspired by the rituals of Amazonian tribes - Amazonian Acai Energizing Radiance Mask - 75ml - $28 - for skin that needs a fast recharge from signs of fatigue and stress. Contains acai berry extract from Brazil - rich in anti-oxidants and vitamin C to fight the appearance of fatigue; guarana seed extract from Brazil - known for its energy boosting properties from its high concentration of caffeine; and Community Trade organic babasau oil from Brazil - an effective nut oil known to soften, smooth and revitalize the skin. Of course having so many different types of masks available means you should go ahead and multi-mask - using different types of mask to suit the different skin types on areas of your face means every area will get exactly the treatment it needs - use as many as you like - we won't judge!